More than 90% of all proceeds that we receive from car donation(s) and repairs are invested back into our program. Car Donation… Are you wondering if we might want your car? The answer is yes! Every car, no matter what the condition, is valuable to us. While low-mileage, late-model cars are perfect for our program, older or high-mileage cars can still help us. High-mileage cars that still have life can be refurbished and made available for sale, helping offset the cost of our programs. Even cars that have served out their useful life can provide parts to other cars in our program before being carefully recycled. Our primary mission is to provide safe and reliable vehicles to low-income wage earners in Frederick County, Maryland. Vehicles are placed with qualified applicants who are referred to us by our Partner Agencies. Each car is thoroughly examined and all necessary repairs completed. Vehicles must pass a rigorous Maryland safety inspection. They are then carefully detailed so that recipients are receiving a car in which they can take pride. Moreover, we don’t walk away after handing new owners the keys, as there is more to automobile ownership than simply filling the tank with gas. We work with each recipient to design a service plan and help the owner stick to it with low-cost car repair service for six months. Second Chances Garage is always in need of donated vehicles. If you’re about to move on to a new vehicle, before you trade it in, think about donating it. Because we’re a certified IRS 501(c)(3) charity, you can be assured that you’ll get the biggest tax benefit from your donation. These tax benefits work in a number of ways but typically fall into three categories. If the vehicle doesn’t meet our strict criteria to be a program vehicle, we repair what needs attention and sell the vehicle either as Maryland inspected or as is from our lot to the general public for the lowest possible price. In this case, your tax deduction would equal the amount for which we were able to sell the vehicle. Unfortunately, not all vehicles that we receive fall into the two categories above. In that case, we either recycle your vehicle or sell it as is for a very low price. If the amount that we obtain is less than $500, you are still entitled to claim $500. The three examples above are just examples. You should consult a tax expert to find out how they would apply to you. Don’t have a way to get us your vehicle? No problem. We will be happy to come and pick it up at no cost to you. We have our own tow truck, so even if your vehicle doesn’t currently run, we can make your gift a reality. So, you’re ready to donate a vehicle? Great. Simply fill out the form below, hit submit, and we’ll take it from there. 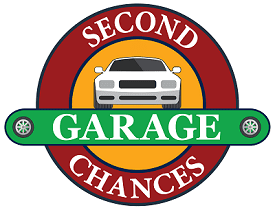 Pick up or delivery * Pick up or delivery I will drop my car off at Second Chances Garage.Please arrange to pick up my car.